Numbers are used in a variety of ways; such as counting and labeling. We can count objects such as cars, toys, and cereal but they can be used to identify buildings, addresses and streets. Talk to your child about your address, neighborhood, street, house, business and signs as you drive or walk around your neighborhood/town. Practice math skills during mealtime! Ask your child to help set the table, give every family member a fork, plate, and napkin. 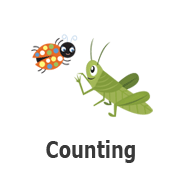 Encourage your child to count the items individually, together and in total. Make mealtime fun while encouraging learning. Cook, bake and play in the kitchen. Cooking and baking are a great way for families to practice numbers, letters, counting, measuring and even fractions. Bake something and have your child help add, count, measure, and mix the ingredients. Baking is a fun math and science experiment.